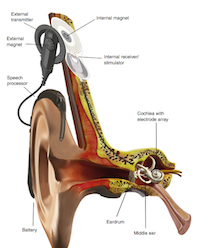 Cochlear implants (CIs) are the first example of a neural prosthesis that can substitute a sensory organ : they bypass the malfunctioning auditory periphery of profoundly-deaf people to electrically stimulate their auditory nerve. Although the ability to make sense of sounds varies widely among the implanted population, many CI listeners can use the telephone and follow auditory-only conversations in quiet environments. However, their speech recognition performances are much poorer in real-life scenarios where the sound they listen to is mixed with other sounds, such as noise or other voices. 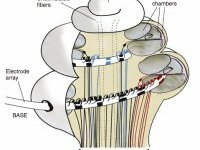 The most commonly-acknowledged reason for this limitation is the poor spatial selectivity of the electrical stimulation : the electrodes are located in a fluid-filled cavity of the cochlea and are separated from the nerve fibers they have to excite by some porous bone (Macherey & Carlyon 2014). The current delivered by each electrode, therefore, spreads widely across the cochlea and excites a large population of spiral ganglion neurons. Because in the normal ear, each subpopulation of these neurons codes for different frequencies, the lack of spatial selectivity of CIs implies a lack of frequency selectivity. As an example, even though contemporary CIs have about 15 electrodes, the number of independent frequency channels they can convey is limited to about 8 which is much less than the several dozen that would be needed to restore normal hearing. It is possible to simulate the cues delivered by a CIs using channel vocoders. By increasing the number of vocoder channels, speech quality and speech intelligibility improve. For 1 channel (1 electrode), the sound cannot be identified. For 4 channels (4 electrodes), without training, we can recognize that this is human speech. For 8 channels, which is the approximate number of channels a CI user can benefit, the speech becomes intelligible. As a comparison, unprocessed speech is also presented. The most recent research in the domain suggests that we have reached the limits of what we can achieve with electrical stimulation and that other stimulation techniques need to be developed, in particular to refine the spatial selectivity. The USCI project forms part of this effort and aims to investigate ultrasound (US) neurostimulation as an alternative method to restore hearing to the deaf with an improved spatial selectivity compared to electrical stimulation.